STAMFORD, Conn.—The aesthetics of Shen Yun Performing Arts were what captured the attention of Mark Anthony and his wife when they experienced the traditional dance and music performance. From the colors to the pure hearts of the dancers, Anthony said Shen Yun’s essence of beauty came from many levels. 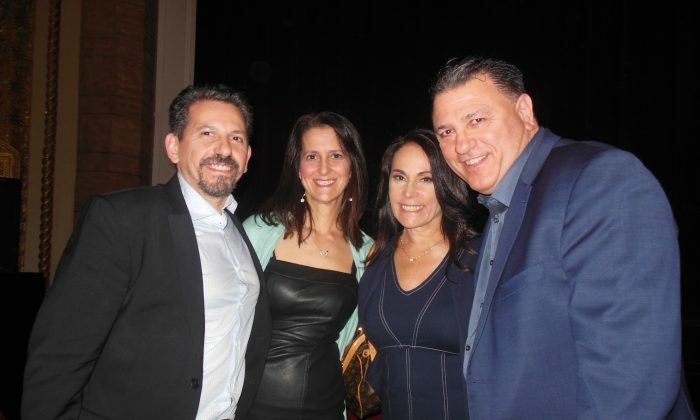 The president of the company Training for Success saw Shen Yun at The Palace Theatre with his wife Tracey Visceglia and friends on March 30. The New York-based company is in the midst of its 2019 tour where six equal-sized groups are traveling the world, performing in sold-out shows in renown theaters. The company’s name “Shen Yun” means the beauty of divine being dancing. Its mission is to bring China’s 5,000 years of semi-divine culture and values and back to the modern world through performing arts. Like Anthony, his wife Visceglia, a teacher, was also struck by the performers’ beauty, but added that it went beyond the aesthetics. The couple shared how the performance portrayed pieces that are inspiring to the audience. “Dance is a way where you can be inspired. It’s a way of expression of both your goals, your feelings and your experience, all wrapped up into one. That creates a level of emotion, which can be interpreted so differently by so many different people,” Visceglia said. Anthony said he found the story-based dance “Goodness in the Face of Evil” particularly touching. The piece tells of a young girl who tries to share her faith in Falun Dafa with her mother but was persecuted for doing that by the Chinese communist regime. Falun Gong, or Falun Dafa, teaches the principles of “Truthfulness, Compassion, and Tolerance,” where adherents seek to orient themselves toward self-betterment, taking responsibility, and putting others first. But the Chinese regime launched a nationwide crackdown on the practice in 1999 and has since continued to systematically persecute Falun Gong adherents in China. People who are caught practicing the discipline in China face severe persecution, including torture, imprisonment, and even death. Shen Yun depicts several pieces about the persecution, which portray themes like spiritual devotion, the benevolence of gods, good and evil retribution, and the search for the meaning of life, according to the company’s website. These values are foundational to traditional Chinese culture and are not political in nature. Instead, they inspire audience members and encourage them to reflect on the modern world. The couple’s friends, Edward and Gina Torres, were also captivated by the storytelling and the performers’ artistry. “I enjoyed it very much! It was very interesting, especially the way the scenery tells a story with the dances and it seems like it’s very well integrated. I enjoyed it very much,” Edward said. His wife Gina, a senior vice president at a bank, was impressed by the performers’ athleticism. With reporting by Sherry Dong.